Having previously reviewed - and loved - Theft of Swords and Rise of Empire, this was the obvious successor. The two-book finale to the Riyria Revelations sequence, said two books also made me reconsider an earlier statement: that the series took a traditional setting and made it wonderful through story, not worldbuilding. I've since changed my mind. While that's definitely true for Theft of Swords, and the world is traditional in terms of its trappings - expect elves, dwarves, castles and kings - the complex plotting of Heir of Novron most definitely ties into the setting. And there are more twists just in said setting than you could shake an Erikson at. While Theft of Swords was sufficiently adventurous that an astute reader could forsee some of the conclusion, nothing similar can be said for Heir of Novron. Both novels are packed with the twists obtainable only from some crazed Martin-Erikson hybrid - which, in case you were wondering, is a good thing. Partly character based, partly historical, I can guarantee than any attempt at an accurate forcast is doomed. Which of course makes the novel even more exciting; even more unpredictable. Character isn't overlooked for plot, however. Royce and Hadrian are still one of the best fantasy duos around, although the sections where they're separate aren't nearly so much fun: they complement each other wonderfully.Royce in particular gets development, though neither are static. One of my pet hates is the character who remains unchanging - even through supposedly life changing events. Our two thieves are the antithesis of this, and that's why I like them. Plus the banter, which helps. One qualm I did have, however, was in the section where Hadrian is forced to pretend to knighthood. The constant praise for his 'natural nobility' feels almost an informed ability: yes, he's a good person, but he and Royce are thieves - and their methods can be dubious. I prefer a little more ambiguity - but that particular scene is a minor complaint, and easily overlooked for the development in - say - Arista. Sullivan writes breathing characters, and it shows. But what about the biggest concern: an ending? I'm pleased to announce that in my opinion, Heir of Novron's conclusion goes far beyond satifactory - and into the superb. A well-crafted mix of twists (and entire U-turns), sacrifice and surprising revelation, it will more than satisfy readers who've made an investment into the series. I also enjoyed the mixed nature of the ending: yes, there was a lot of unambiguous occurrence, but it doesn't simply end 'happily ever after' - there are still problems, and that keeps the series grounded in realism. One thing I would have liked to see, however, is more of the Nationalists - remember them? The movement played a prominent role in the first two novels, but seemed to disappear in favour of Degan Gaunt as a character in the last. I'd have liked to see the future Nationalist struggle, especially with regard to Empress Modina - something I hope could be explored in future novels or short stories, as they go unglimpsed in the epilogue. 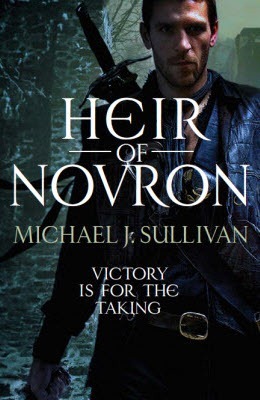 Heir of Novron is the conclusion to the Riyria Revelations, cementing it in a position as a new classic of modern fantasy: traditional in setting, but extremely unconventional in - well - everything else. The series won't be to everyone's tastes, but for those who like a dynamic duo, plenty of adventure (and skulduggery), and a story on a truly epic scale, you won't be disappointed.